In less than a month, the Wood River Valley will see an influx of summer visitors. The area's marketers are hoping their efforts will mean packed businesses and energized crowds to launch the season. The Sun Valley Marketing Alliance held a members' meeting Wednesday, updating attendees on the winter season, what's being done to draw visitors this summer and what lies ahead. This summer, Seattle and Los Angeles are being targeted, contrasting city life with an escape to Sun Valley. "The umbrella campaign is 'skip town,'" said Arlene Schieven, Sun Valley Marketing Alliance president and chief marketing officer. Stone-skipping from a computer that will allow people to skip a stone on an actual lake in Sun Valley. This will be done real-time via a robot. "This is something that has not been done before and there is already significant media interest in the initiative," Schieven told the Idaho Mountain Express. Packing your virtual car to win a trip to Sun Valley. More than 30 member-donated prizes can be included in the car, but not all items will fit. People will have to explore the prizes and, in the process, learn about local businesses and experiences, then decide what to pack. Once they close the doors of the car, they will be entered to win a trip to Sun Valley. Winners will also receive what they packed in the car. 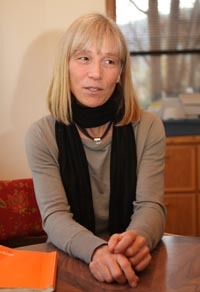 The intention of the promotion is to develop something that would lead to online engagement so people experience Sun Valley from their computer, Schieven said. "To maximize traction of limited marketing dollars, we are focused on doing things which garner 'earned media,'" she said. The alliance also is hoping to involve businesses during next month's Ride Sun Valley mountain biking festival. The event last year drew 1,100 racers. "This year we expect a 15-to-20 percent growth in that number," said Greg Randolph, the alliance's director of public relations and social media. With up to 1,400 racers, plus their families and friends, businesses should be busy June 29-July 8. "They come here, they eat a lot of food, they go shopping," he said. The alliance continues to boost its social media presence but urged members to be patient with measurable results. Zach Crist, alliance board member, said social media builds awareness of a brand—in this case, the Sun Valley area—generates engagement with others on social media sites, and later turns into transactions. "That takes time," he said. As summer activity gets into high gear in July, the marketing alliance will turn its attention to winter, where approximately two-thirds of the group's advertising budget is spent. Schieven said the group is focusing more attention on winter to boost occupancy rates after the Christmas holidays. "If we're a mountain resort destination, we can't have a dead January and February," she said. "We are really focused on that."